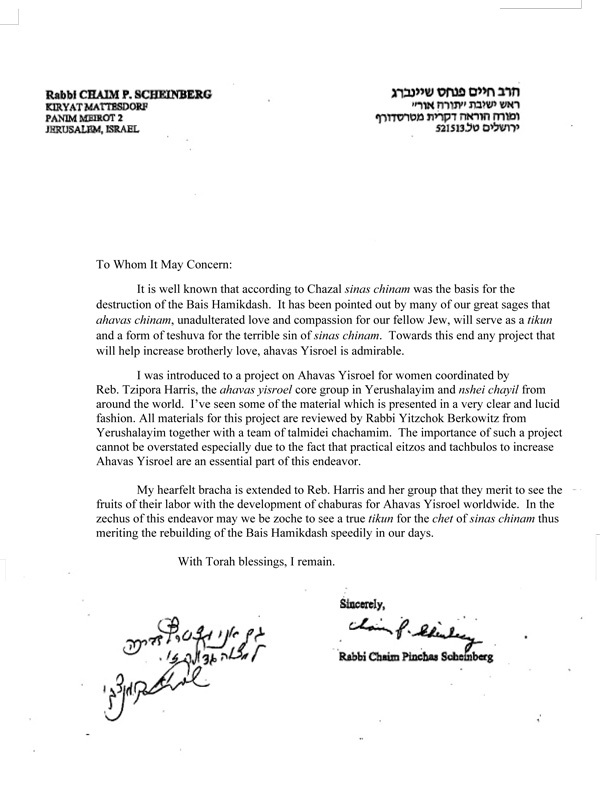 The Jewish Women’s Project for Ahavas Yisrael (AY Project) exists to create a worldwide awareness amongst Jewish women of our obligation to love and respect every Jew, by reinforcing the knowledge that all Jews are connected and responsible for one another. The AY Project inspires Jewish women to transform themselves, their families, their communities and the Jewish world by focusing on how to navigate interpersonal relationships & pertinent topics from a Jewish perspective. A group of women noting the rise in physical, emotional and spiritual suffering, terrorism, anti-Semitism and an overall decline of ethical behavior worldwide sought the advice of Jewish leaders. The responses overwhelmingly stressed the importance of Ahavas Yisrael, loving our fellow Jew despite our differences. As a result, the "AY Project" was born. 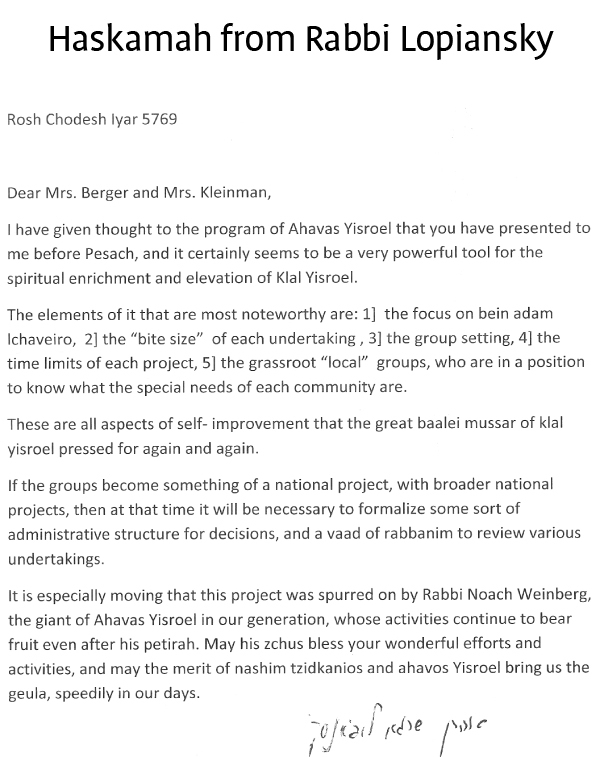 What Is the Ahavas Yisrael Project? Speak well of your fellow Jew. Respect your fellow Jew through validation, acknowledgment and appreciation. Care about one's material and physical needs. Resolve to make amends for carelessness, past mistakes or neglect in interpersonal relationships. The Ahavas Yisrael (AY) Project inspires Jewish women to transform themselves, their families, their communities and ultimately the entire Jewish world by focusing on how to navigate interpersonal relationships and pertinent topics from a Torah perspective. The Ahavas Yisrael (AY) Project consists of a series of 20 minute weekly lessons that address a range of important issues. Each prepared lesson inspires thoughtful discussion in a social setting and ends with a goal for the coming week to help women "stretch" themselves and make a positive difference in their interactions with others. As more of us commit to working on our "Ahavas Yisrael", love of our fellow Jew, we create an entirely new level of unity among the Jewish people, thus transforming the entire world in the process. A group leader gathers women in her community to review a 20 minute lesson focusing on the laws governing interpersonal relationships and other other topics from a Jewish perspective. The lesson consists of a topic of the week, a relevant story highlighting this topic, three discussion questions and an exercise designed to integrate newfound awareness and practice in one’s daily life. Enjoy free access to all AY lessons and materials, enabling busy women to actively help the Jewish people. Utilize opportunities for teaching and coaching, using printable lessons that don’t require preparation. Unite your community in a social, inclusive and interactive environment. Create a personal support system for your own spiritual growth. Create a springboard for conversations with family members. Incorporate practical lessons and exercises into your daily life…in your home, work, community and beyond! 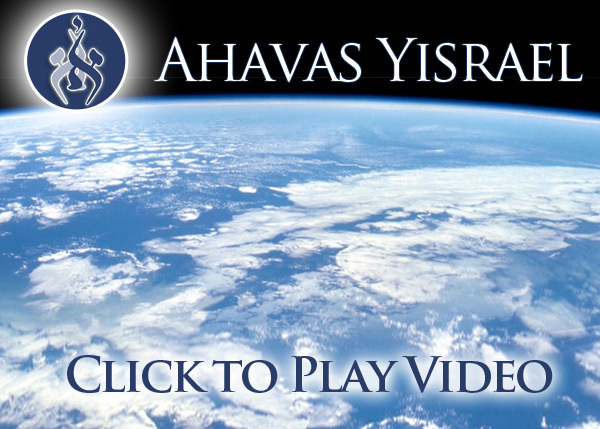 A dynamic 5 minute video presentation that gives insight into the importance of ahavas Yisrael and inspiration to become involved in the Ahavas Yisrael (AY) Project. This presentation is a "must see" to get started for yourself and your group. Hear testimonials from AY Project group leaders and members which demonstrates how powerful the program can be on a wide scale. An entire Jewish community participates in the Ahavas Yisrael Groups! Understand what is going on in the world around you, and how you can help make a difference, be it in your local community or around the world. 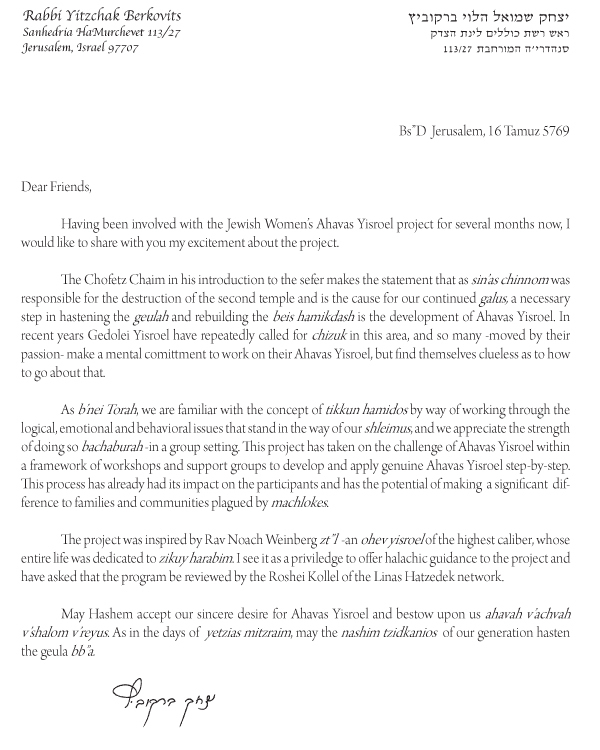 The Ahavas Yisrael (AY) Project inspires Jewish women to transform themselves, their families, their communities and ultimately the entire Jewish world by focusing on how to navigate interpersonal relationships, character traits and pertinent topics from a Torah perspective.